This is where organic really counts and is worth the investment. Start cooking the chicken at room temperature, if it’s cold or frozen it will be dry because it will lose juice while it cooks. It should only take 20 minutes out of the fridge. If starting with frozen chicken, yes you need to put a plate under the bag and leave it in the refrigerator overnight from frozen or you will get tough and dry results, unless you’re boiling it, then losing juice into the broth doesn’t matter. Nothing you can buy compares to organic home made chicken broth. 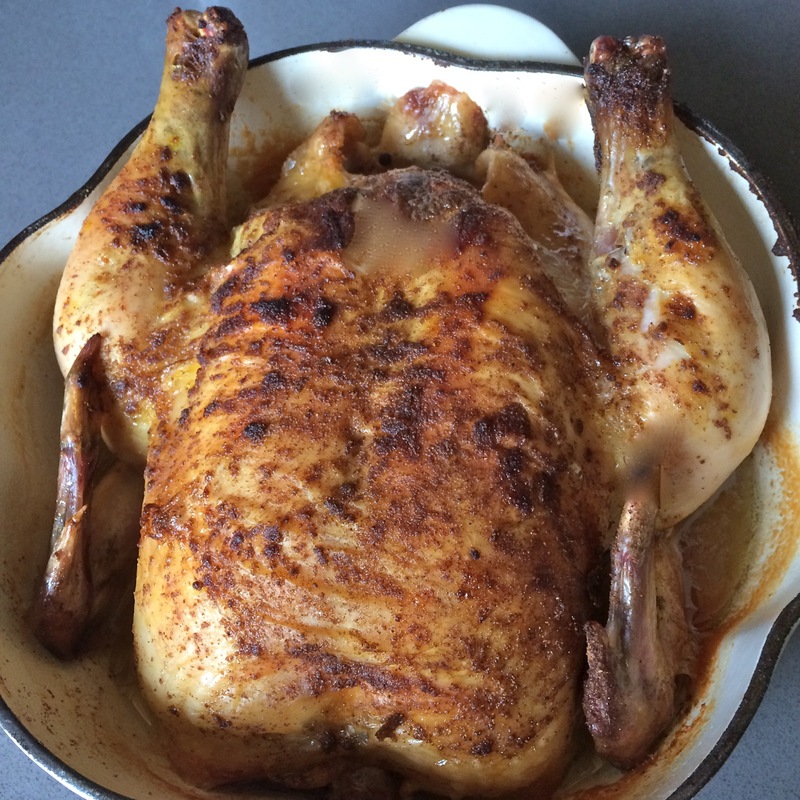 Roast chicken in a tight fitting pan, tuck in the wings and fill with water up to the bottom of the legs. Rub the skin with olive oil, dust with seasoning (shown with Heroccan Herblends) and cover the pan and cook at 400ºF for 40 minutes, remove the lid and cook about 20 more minutes, until the internal temperature reaches 174ºF and the skin is brown and crisp. Aluminum foil can replace a lid. Remove chicken skin before storing leftovers, it’s only crisp straight from the oven and turns to an unpleasant rubbery texture once cooled. Remove chicken skin before cooking for less fat, but coat the chicken in olive oil to keep the meat moist, remove the medallions on both sides of the cavity for even less fat. To guarantee moist leftover chicken cover it in stock or broth while warm, chill immediately and reheat in the broth when ready. For less fat in chicken soup, freeze the stock or broth and the fat will rise to the surface and can be easily peeled off with a spoon. By the way, boxed broth that isn’t organic has nothing to do with chicken, it’s a chemical mix with varying degrees of too much salt, in water. Make some this week and taste the difference. 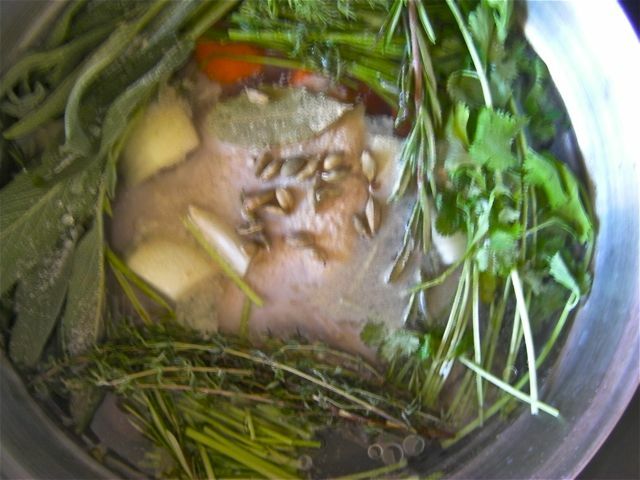 When roasting or boiling chicken for maximum flavor: put cut onion, carrot and celery (under the bird when roasting, on top of the bird when boiling), put a half/sliced head or garlic or whole lemon in the cavity, the cavity is a good place for fresh rosemary sprigs, and sage is nice slid under the skin. This is when herbs and spices will really make a difference in the flavor of the chicken meat. 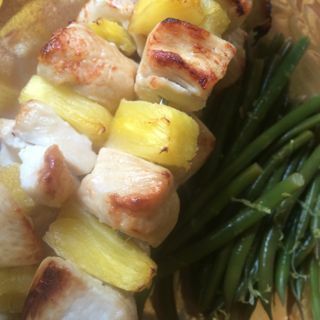 For grilling it’s best to cut up chicken into large cubes, and marinate the meat, white meat needs to be marinated for an hour or more (in the fridge), dark meat is good with 30 minutes, then put it on skewers. BBQ sauce is a glaze and should be brushed on in the final 15 minute, after the meat is already browned. Cook vegies on separate skewers to accommodate vegans and a shorter cooking time. When hosting a party: skewers are best, big pieces of chicken are risky to get fully cooked on the grill and people will eat less, you can divvy up their serving size – few will take more than one skewer and there will be a lot less garbage. 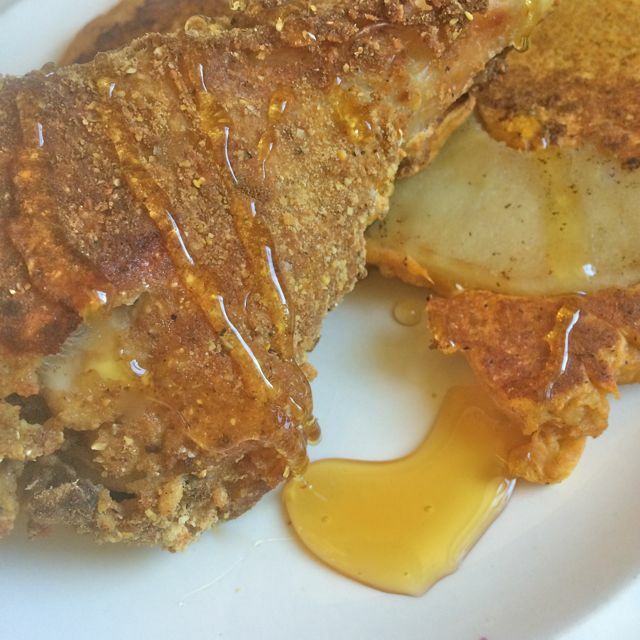 Cornflake crumbs bake as crisp as fried chicken and are a healthier choice. Shown with sweet potato pancakes with an apple cooked into it. Corn flake crumbs make a much better coating than breadcrumbs when baking chicken to taste like fried.